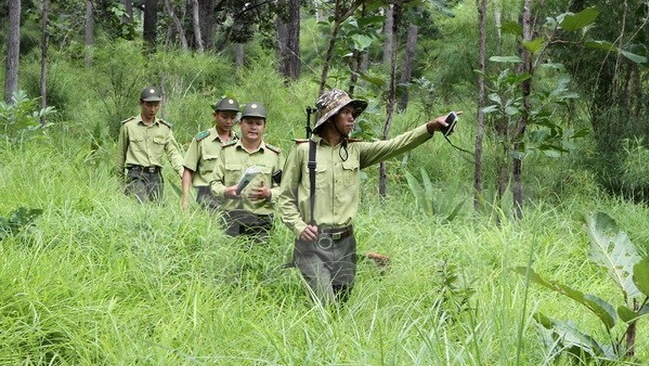 Representatives from the Vietnam Administration of Forestry (VNFOREST) and the Lao Department of Forestry Inspection (DOFI) recently joined a meeting in the central province of Ha Tinh on October 30 to review their cooperation in forestry law enforcement. Speaking at the meeting, Deputy Director of the Vietnam Administration of Forestry, Pham Van Dien, stated that the two countries have agreed to step up patrols in order to protect forests and ecosystems, and manage forests sustainably as a measure to cope with climate change. For his part, Director of the Laos Department of Forest Inspection, Linthong Douangphachanh, said the meeting is a good opportunity for the two countries to share their experience in forest management. At the meeting, the two sides agreed to intensify measures to realise activities listed in their cooperation memorandum of understanding (MoU). Furthermore, they will increase exchanging information related to policies, regulations, and bilateral negotiation for a voluntary partnership agreement on forest law enforcement, governance and trade. Vietnam and Laos share a borderline spanning 2,340 km along their 10 provinces. The two countries have set up seven international border gates and six main border gates across the line. In the past time, the VNFOREST and the DOFI have cooperated at the central and local levels in forest protection and management, which contributed to the reduction of forest fires and legal violations related to logging, timber trade, and wildlife trafficking./.